Mainframe supports JAVA. You can have a mix of Java and COBOL modules. The Java plays a predominant role in modernizing mainframe applications. 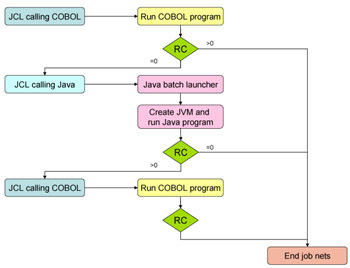 You can understand how JCL calls both Java and COBOL programs during batch job execution. The next modernization is the data transfer between these job steps (Cobol and Java ) can be realized by storing data in temporary data sets or in UNIX System Services files. For Java developers who have never worked on z/OS, the OMVS Shell and the ISHELL might be difficult to handle.